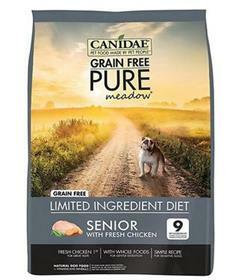 Canidae® Grain Free PURE Meadow Senior Dog Dry Formula with Fresh Chicken uses simple recipes for sensitive dogs. Choosing a grain free limited ingredient diet may help dogs who experience food sensitivities. Less ingredients could mean less chance of sensitive reactions. This limited ingredient recipe is made with 9 key ingredients that are easily recognizable, plus all the vitamins and minerals your dog needs. Ingredients: Chicken, chicken meal, turkey meal, sweet potatoes, chickpeas, peas, potatoes, suncured alfalfa, chicken fat (preserved with mixed tocopherols), natural flavor, minerals (iron proteinate, zinc proteinate, copper proteinate, ferrous sulfate, zinc sulfate, copper sulfate, potassium iodide, manganese proteinate, manganous oxide, manganese sulfate, sodium selenite), vitamins (vitamin E supplement, thiamine mononitrate, ascorbic acid, vitamin A supplement, biotin, niacin, calcium pantothenate, pyridoxine hydrochloride, vitamin B12 supplement, riboflavin, vitamin D3 supplement, folic acid), choline chloride, mixed tocopherols (a preservative), dried enterococcus faecium fermentation product, dried lactobacillus acidophilus fermentation product, dried lactobacillus casei fermentation product, dried lactobacillus plantarum fermentation product, dried trichoderma longibrachiatum fermentation extract.